Silver is one of those metals that tends to tarnish very easily, especially if it exposed to the air or if people are handling it. As both of these things are hard to prevent, silver objects start to develop blackish patches and generally do not look as nice as they can. 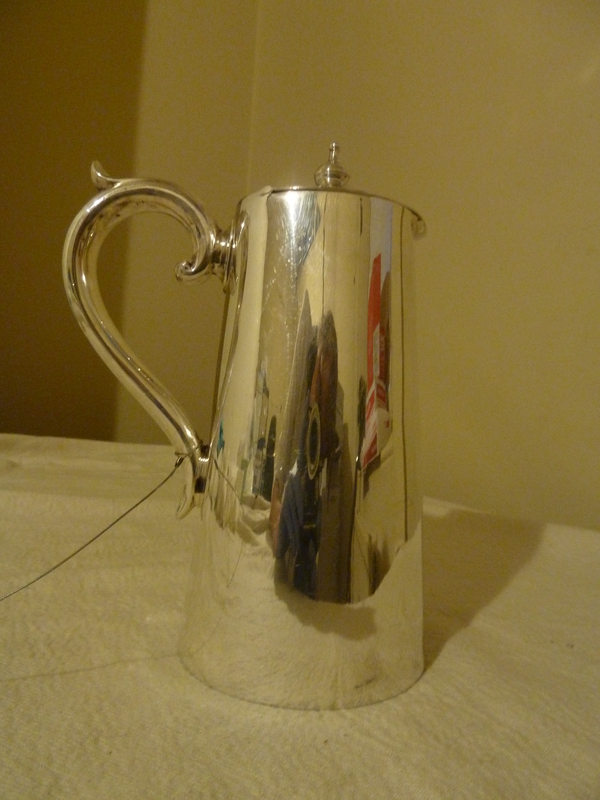 We have a silver coffee pot that sits on a tray outside the Dining room. We moved it into the kitchen for Christmas and realized that, in better lighting, it was in need of a clean. We are careful about using chemicals to clean objects because, more often than not, chemicals tend to take off layers of material. 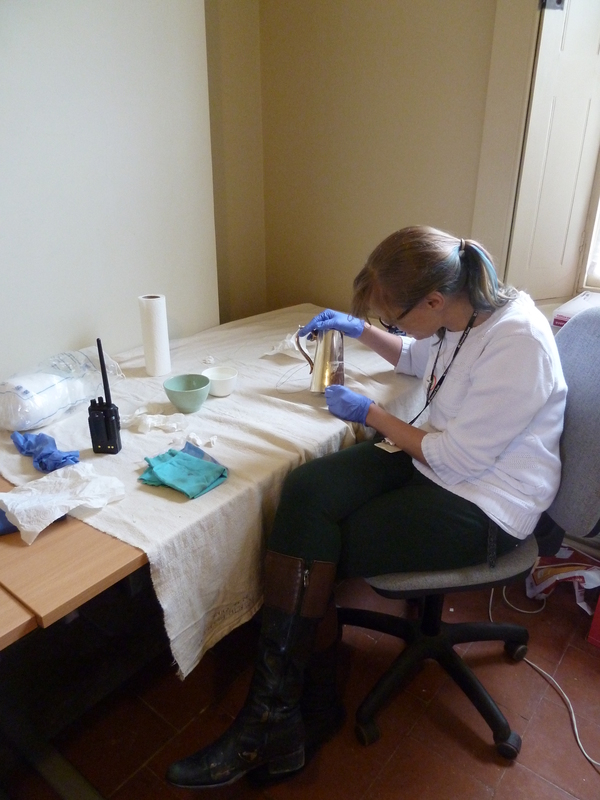 We dust items regularly, using pony hair and hogs hair brushes and sometimes specially designated cloths. But the coffee pot had tarnished beyond that point (or at least the point where it would take several hours to clean one small area). 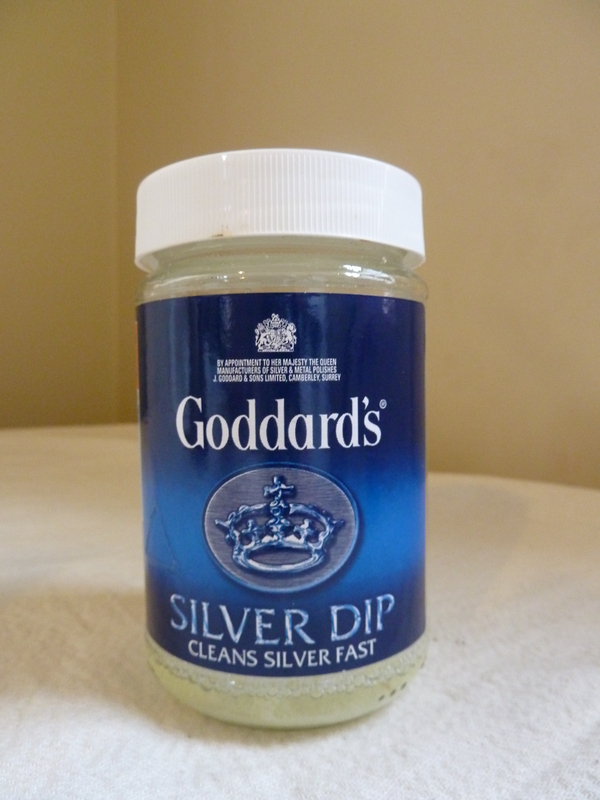 We use a product called Silver Dip to clean silver objects. It works by removing a single layer of silver (along with all of the tarnish) to reveal the clean silver underneath. whole of the object is clean. To get into the small nooks and crannies along the lip and the handle, I used a cotton wool bud, repeating the above. 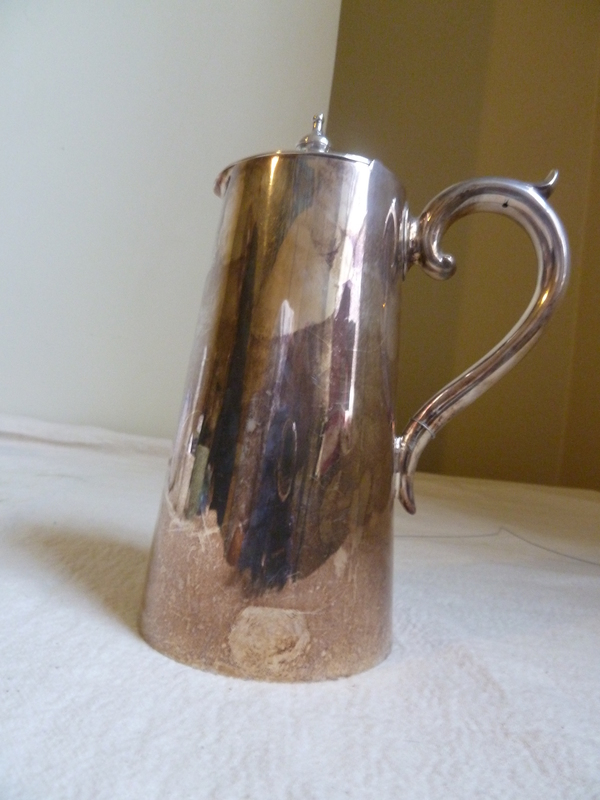 The pot was then buffed to bring out the shine. Categories: Uncategorized | Tags: Arts & Crafts, cleaning, Coffee Pot, collection, conservation, deep clean, Dining room, Historic house, Kitchen, National Trust, object, Silver Dip, Standen, Water | Permalink. One of the things that I got up over the weekend was assisting one of our volunteers in carrying out the Tower tours. These run Thursday and Sundays over September and October as well as February to May. You may be wondering why there is a three month gap in the summer – from June to August – this is because we have brown long-eared bats that use the attics in the tower to roost and raise their young. Only the females and their teenage babies will roost here, whilst the 1 male in the colony will roost elsewhere. With around 20 females in the colony, each one has a single baby. So you can imagine it is quite busy up there! Today was the first chance that I got to up the water tower since I started here, nearly 3 months ago (time just flies by!) and I would definitely recommend a visit. As you can tell by its name, the water tower, it was used to filter all of the water that the Beales’, and their servants, used, from washing to drinking. 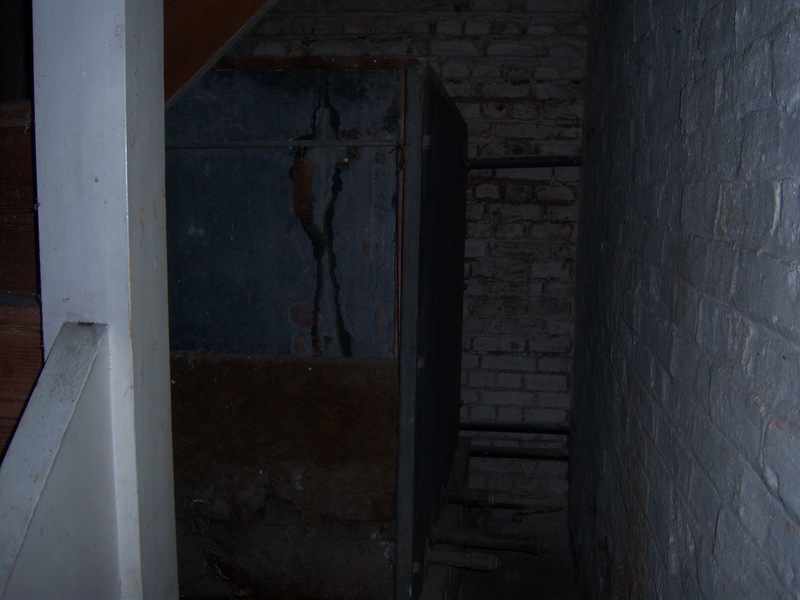 It is a rather complex system using vast tanks hidden underneath the ground to collect rain water, which is then pumped up to the water tower using slate tanks and lead lined pipes (surprisingly all of the Beales lived to ripe old ages!) . 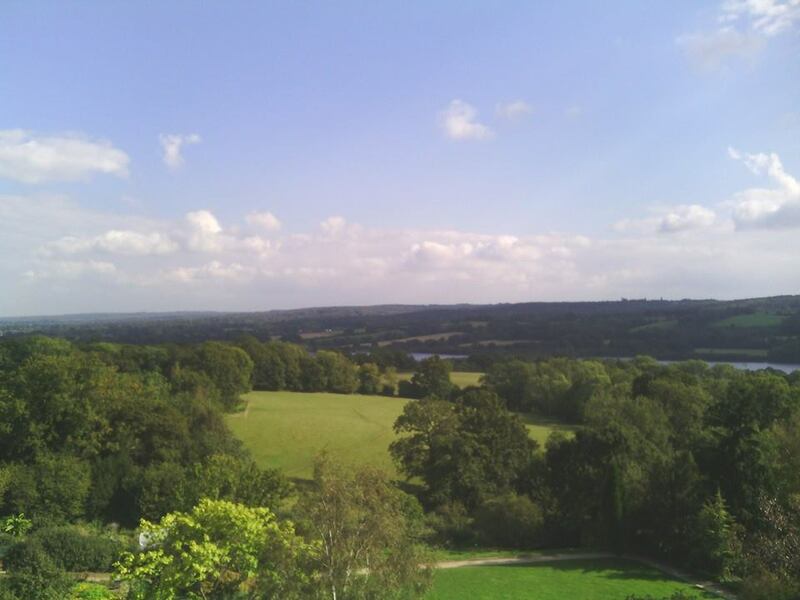 At the top is a viewing platform, that has beautiful views of the surrounding countryside and the Weir Wood reservoir. 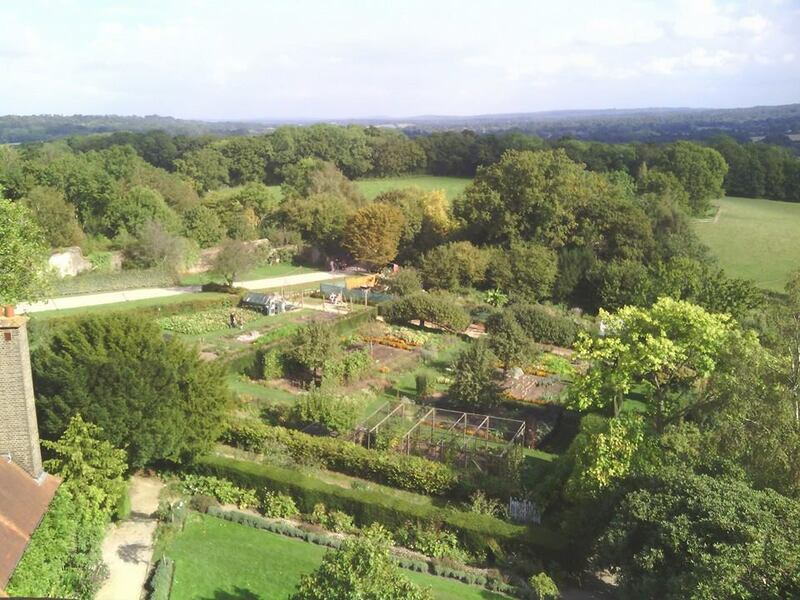 It also shows how much land that the Beales owned and most of the 12 acres of gardens. As well as being used as a viewing platform, Maggie and Helen (the 2 unwed daughters) used to sleep up there on hot nights under the stars. 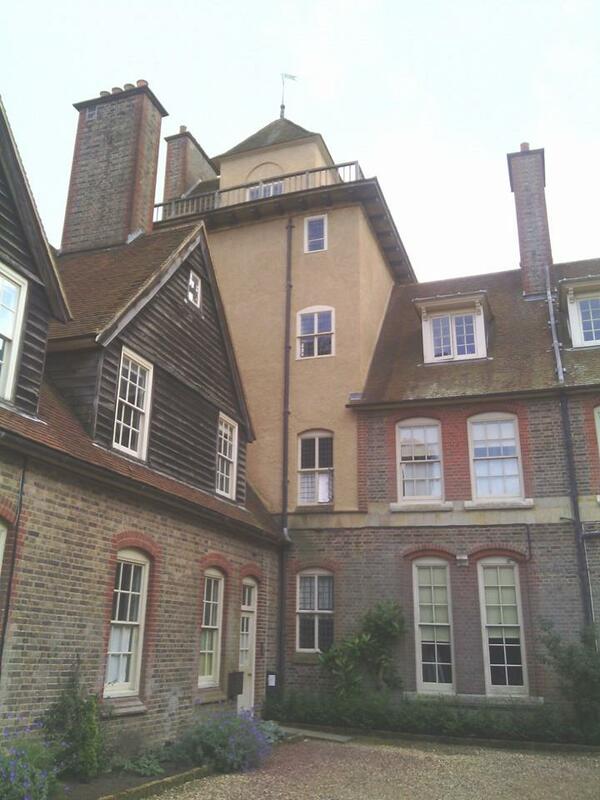 Categories: Uncategorized | Tags: Arts & Crafts, Bats, Beale, Brown Long Eared Bats, Historic house, House, House Team, Kitchen Garden, National Trust, Phillip Webb, Standen, Water, Water filters, water tower, Weir Wood Reservoir | Permalink.